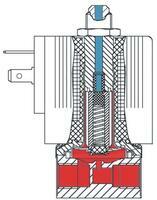 Direct-acting 3/2-way plunger-type solenoid valves (e.g. Bürkert Types 6012 and 6014) have three ports and two valve seats. Alternately, one valve seat is always open or closed. The circuit function of the valve depends on how the ports are "assigned", i.e. how they are connected to the fluid system. In circuit function C (NC), port P (see Figure 2) is connected to the supply which ducts pressurized fluid; port A forms the outlet and port R is the return or venting port. In the de-energized state, a conical spring forces the core (plunger) onto the valve seat 1 and blocks off supply P. Outlet A is connected to return R. After energization, the core is pulled into the solenoid coil, whereby valve seat 2 is sealed off via the spring mounted valve seal 2. The return R is thus shut-off. As the plunger moves upwards, valve seat 1 is also opened and the fluid can flow from P to A. In circuit function D (NO), the return R is normally shut-off.